32 F A ll 2018 Practice l ink.com J O B D O C T O R CAREERS AS UNIQUE AS YOU. The challenges you seek. In the settings you prefer. With schedules to fit your life. You're passionate about health care—but what else? Climbing to the top of a mountain, or exploring the bottom of the sea? Waking up before dawn to fish or staying up late to write a new song? At MultiCare you can accomplish your professional goals, whatever they are, and pursue your personal interests, wherever they take you. >> Meet our people at jobs.multicare.org Copying and pasting poorly Copy/paste is both the best friend and worst enemy of an online physician job seeker. As long as you customize your response with a few opening words specific to the employer or location, copy/paste allows you to get a lot of responses out very quickly. The body of your cover letter also can be copied and pasted from one response to the next. It will tell employers when you are available and what you are seeking. All prospective employers want that kind of differentiating detail. Copy/paste is your worst enemy in two circumstances: It makes you too generic. If you don't customize the cover letter to the location, we don't know why you want to live and work in our community. A generic cover letter comes off as canned and leads the reader to assume you are taking a buckshot approach to your job search. If a glance in my shared database shows that you sent exactly the same cover letter to six of my colleagues in the last six months, then I'm not highly motivated to put you at the top of my to-do list for today. You simply don't look like an intentional, serious candidate for my city and practice. It's wrong. 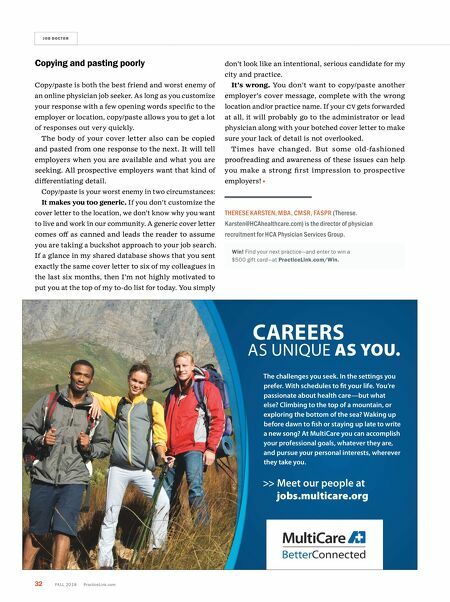 You don't want to copy/paste another employer's cover message, complete with the wrong location and/or practice name. If your CV gets forwarded at all, it will probably go to the administrator or lead physician along with your botched cover letter to make sure your lack of detail is not overlooked. Times have changed. But some old-fashioned proofreading and awareness of these issues can help you make a strong first impression to prospective employers! THERESE K ARSTEN, MBA, CMSR, FASPR ( Therese. 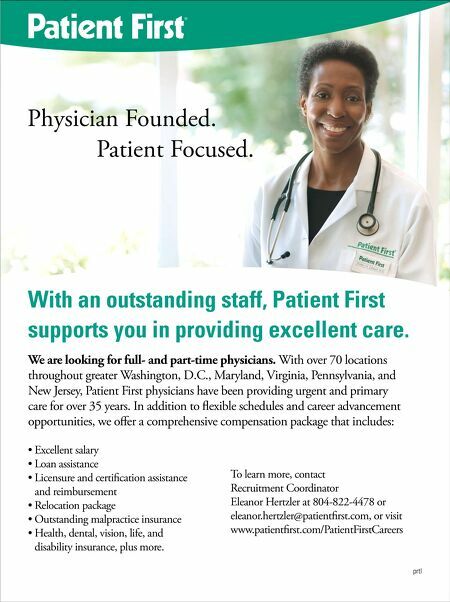 Karsten@HCAhealthcare.com) is the director of physician recruitment for HCA Physician Ser vices Group. Win! Find your next practice—and enter to win a $500 gift card—at PracticeLink.com/Win.